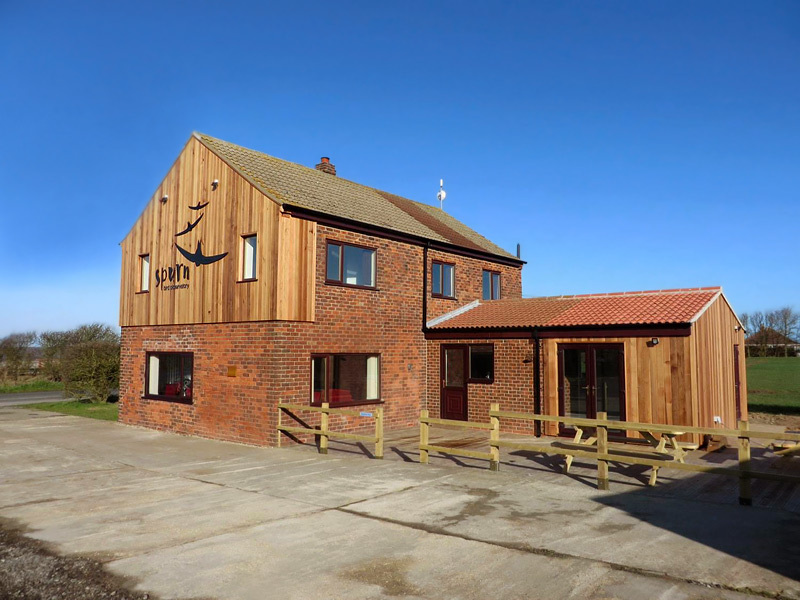 Location: Spurn Bird Observatory sits in the middle of arguably the best area for birding in mainland Britain. Set in the small village of Kilnsea, it sits atop the Spurn Peninsula at the mouth of the river Humber. Trapped between the river and the sea, the peninsula forms a natural funnel, making it an excellent place to witness thousands of migrating birds. The Observatory is located 24 miles east of the city of Kingston upon Hull, which has regular train services to a number of major British cities such as Manchester and London. Although there are bus services that run to just two miles away, the nearest regular bus service is 8 and a half miles away meaning public transport is not the ideal method of traveling to Spurn. Services: Within walking distance from the Observatory are a number of reserves: Kilnsea Wetlands and Beacon Ponds support thousands of waders. Little Terns breed alongside, as do Avocets and Oystercatchers. Any bushes nearby can be alive with song birds. Pied Flycatcher, Redstart and Whinchat are regularly seen, with scarcities like Red-backed Shrike, Scarlet Rosefinche, Barred Warbler, Red-breasted Flycatcher and Wryneck all a possibility. During autumn thousands of Woodcocks, Short-eared Owls, Eurasian Robins, rails, thrushes, finches and buntings descend upon the area having completed their migration across the North Sea. Throughout both spring and autumn birds can be seen migrating past the ‘Numpties’ watch point, where observers stand to count passage birds. But one of the most special experiences on offer at Spurn is to witness thousands of Common Swifts flying past the watch point during midsummer. Rarities are always possible, providing mega highlights such as Siberian Accentor, Masked Shrike, Pine Buntings..
Guestrooms: The observatory offers hostel type accommodation; meaning the kitchen, bedrooms and bathrooms are shared areas. The observatory offers 13 beds; 11 of which are shared rooms where bedding is not provided, and then a two bed private room where bedding is provided. Bed prices are available from £13 a night. The facilities are kept clean by the observatory staff, and every effort is made to make visitors feel welcome and at home. Wi-Fi and computer facilities are available to all residents. A log call of the day’s bird sightings is taken in the observatory every night, when totals and species are collated for the observatories records. Whilst a kitchen is available for use of observatory residents, there is a nearby pub; the Crown and Anchor just a two minutes’ walk away, which provides home-cooked food. The nearest shops and cash points are located 8.5 miles away in the village of Patrington, or alternatively in the small town of Withernsea 10.5 miles away.